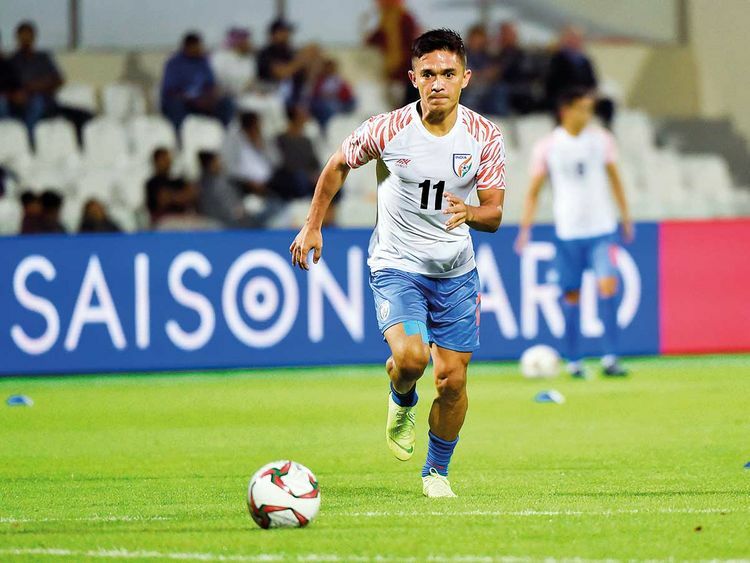 Dubai: India’s football captain Sunil Chhetri, who was announced as a 2019 Padma Shri award recipient in New Delhi on Saturday, said he is prepared to serve Indian football for many more years. The 34-year-old Chhetri, India’s most capped player, took his tally to 67 goals from 107 international appearances at the ongoing 2019 AFC Asian Cup in the UAE. India later crashed out. “I am happy with the recognition and I am feeling encouraged and motivated to set myself with fresh goals. This is a huge honour for me and for Indian football, and I cannot explain how it feels at this moment,” Chhetri told Gulf News after the announcement that he was one of the recipients of India’s highest civilian honour. “I can only promise that I will keep working hard and be worthy of this [award]. There are many people who have also worked hard to ensure a solid career for me, and to see them all happy is a great feeling indeed,” he added. Chhetri scored twice in India’s 4-1 drubbing of Thailand in their opener at the 2019 AFC Asian Cup. Despite losing to hosts UAE 0-2, the Blue Tigers needed just one point from their last Group A encounter against Bahrain but a final minute penalty saw India lose by a solitary goal and fall short of a first-ever qualification to the knock-outs. “On my part I will continue to do what I do best, and that is to score many more goals for my team. And to do this I need to work hard and keep fit,” Chhetri vouched. The final six rounds of the Indian Super League (ISL) that recommenced on Friday with Kerala Blasters holding ATK to a 1-1 draw, will see Chhetri-led leaders Bengaluru FC go head-on against second-placed Mumbai City FC on Sunday. After 11 matches, Bengaluru FC sits at the top of the ten-team standings with 27 points, while Mumbai City FC is second with 24 points after 12 games.